Mama's - Orange Sticky Bun 60mLSunday mornings the mama's way. Gooey cinnabun & sugar-orange gla..
Mama's - Key Lime Pie 60mLA cool and tangy favorite. Key limes, whipped cream, and Mama's love.Avail..
Mama's - Coconut Cream Pie 60mLMama's prized coconut cream pie, with whipped cream and shaved almond..
Mama's - Blueberry Cheesecake 60mLMama doesn't know the word "diet". 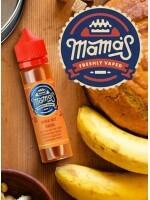 The flavors consist of rich cre..
Mama's - Blackberry Cheesecake 60mLThe Mama's way! Tart & sweet, with a swirled blackberry puree..
Mama's - Apple Pie 60mLAs only Mama makes it. Fuji apple, cinnamon filling, and her secret crust.Ava..